Hundreds of disused coal mines throughout the world experience the same phenomenon. When the hygrometry and temperature are just right, the dust in a poorly sealed pit can burst into flames in even the slightest flow of oxygen. 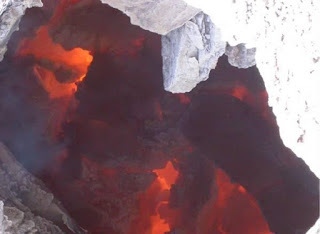 The problem at the Jharia coalfield is that no one knows how to control this steadily expanding underground inferno. Five hundred thousand people live either above or in the immediate vicinity of this enormous furnace that comprises seventy separate blazes and extends over hundreds of acres. The ground has reached a temperature of 120°F, toxic fumes seep through the slightest crack, and their homes have become uninhabitable. And that's not all: Buildings collapse as the ground gives way, children disappear down cracks that open up without warning, and the land has become uncultivable. Sixty-six million tons of coal have already gone up in smoke with no tangible gain other than to make the air of Jharia the most polluted on the subcontinent. The decision to transform some of the underground coal seams into open-cast mines has allowed some of the fuel to be recovered, but at the same time it is helping the fires to spread by introducing large quantities of oxygen into the ground. I'll admit, I had never heard of this phenomenon, but it apparently happens in many locations around the world (in fact, there's one burning in Pennsylvania since 1962), and these fires are difficult and costly to fight.